For many small business owners, managing the daily operations of a company is a full-time job. While you may succeed in managing all the roles, you’ve probably felt like there’s never enough time to do it all and that too at the same time. As a result, it’s common for marketing to become an afterthought for business owners as they are already struggling with the “essential” tasks, how could they possibly add another thing to the list? With email marketing, however, promoting your business and acquiring new customers or connecting with existing customers becomes a whole lot easier – and that’s only a preview of the much bigger email marketing picture here. It may seem tough but it’s a lot easier and cheaper and effective than rest of the marketing techniques. Read Some More Interesting Stats. Easing thing out, email marketing is a powerful communication tool to develop the rapport with your customers. It gives you a chance to speak to a lot of people at once and expand your reach at times. And it allows you to stay connected with loyal customers and on-the-fence prospects who otherwise may have never interacted with your brand again. Let’s talk about a scenario to understand things in a better way: An individual is exploring your website. He looks around a few pages but leaves with an empty shopping cart when he doesn’t see a sweater in his favorite color. Maybe he will return and consider making a purchase, but the chances are slim. Now imagine he had a chance to hear from you again – an opportunity to sign up to your email list and leave the door open for future interactions. And quite possibly, a win-win scenario of a sale for you and a satisfied customer who found a sweater in the perfect shade of his choice. And that’s what sets email marketing apart from traditional advertising. Instead of just telling consumers about your company and hoping they make a purchase, you’re making real connections with those who are truly interested in your business and building long-lasting trust. 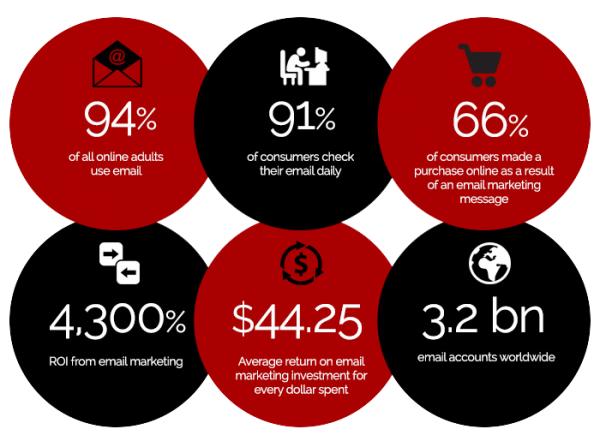 Considering that most people prefer to communicate with brands through their inbox, email marketing is a no-brainer. So what are you waiting for? What do you hope to achieve through email marketing? While this may change over time, it’s important to consider the purpose of your emails and set goals that are both measurable and attainable. For those just starting out with email marketing, you may want to focus your goal on growing subscribers. In this case, your goal might look like the following: I plan to collect 1,000 email subscribers over the next 12 months by leveraging online and offline opportunities to attract sign-ups. By including a numeric value, a due date, and a general idea of how you plan on meeting that number, you’ll have a clear target to work towards. 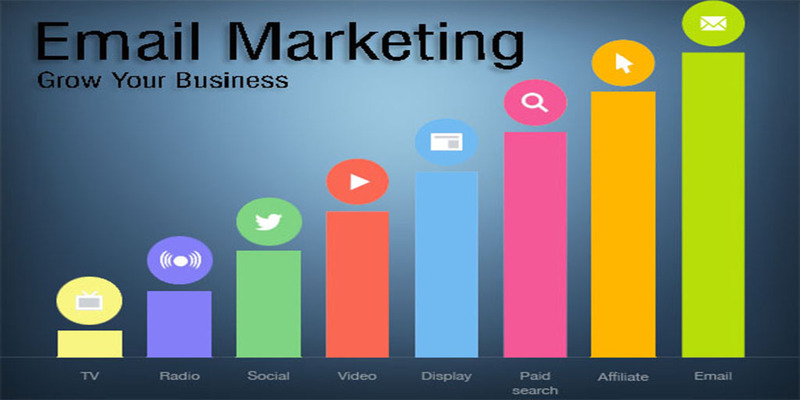 It can even provide guidance for executing tactics that’ll help you achieve your end goal and grow your business with email marketing. As you plan your tactics, also consider the target audience you hope to reach. For example, a fitness trainer with a focus on health and wellness might reach out to those who want to start exercising and changing their diet. Understanding your ideal customers will help you determine the best ways to connect and communicate with them. Set goals with numeric values, a due date, and a general idea of how you plan on meeting that number. The sign-up form is where your website visitors will submit their email address to begin receiving your emails. Typically, you can put it in the header or sidebar of a website page, or as a pop-up box that displays over a website. It’s an easy first step for both you the business owner and your prospects, and one of the most important to grow your business with email marketing. Why? Because this is the place where you must convince your visitors that it holds value for them and they can get it by signing up for your emails. sees your sign up form will wonder “What’s in it for me?” – and it’s essential that you answer this question in your form. If you plan on offering an incentive, such as a free eBook or printable, be sure to mention this in your message. While you can include a variety of fields in your sign up form (e.g. name, address, state, favorite color), don’t go crazy just for the fun of it – the basics will do. While the form should be featured on your homepage (preferably above “the fold” in the header), consider adding it to the sidebar and on other pages, such as your blog. To really grab a visitor’s attention, consider using a pop-up or lightbox form. From a design perspective, your sign up form should be consistent with your company website and/or branding, yet still, stand out from the rest of your website. This will allow for a cohesive user experience, which further adds to your business’s credibility. Additionally, consider the size of your sign up form, as well as colors that may be more attention-grabbing. Now that you have a place to collect subscribers, it’s time to focus on how to do so. Offering an incentive your audience will want is a great way to encourage them to sign up to your emails. Some incentive ideas include a free trial or discount on a service or product, a downloadable checklist, or even an eBook. Tap into your social following on platforms such as Facebook and Twitter by encouraging them to subscribe to your emails. Add a sign-up form to your Facebook business page, tease content exclusive to those signed up to receive your emails, or post a link to a hosted web form. Feature a valuable prize and host a contest that requires an email address upon submission. Be sure to promote it on your website and social media! From landing pages and shopping carts to membership clubs and pop-up forms, you can connect your ESP with a unique integration tool to help grow your subscribers. Whether you’re at an event or in your brick-and-mortar store, you can leverage these interactions with customers and prospects to sign up for your emails. Download a mobile email sign up app to your phone or tablet, or use an “old school” pen and paper form that can be easily transported from your store’s register to your next event. Keep reading for the upcoming part of this blog. Also if you haven’t read about Top Content Marketing Trends to be followed, read it here. Check out the most amazing Offline Marketing Strategies.